X13.com from Colorado and ATU2COM from Washington state. I’ve previously written about two .com license plates in Texas, one of which is mine. 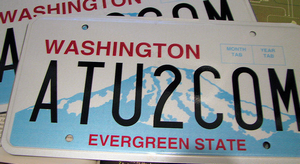 A couple readers sent in their own license plates from different states. 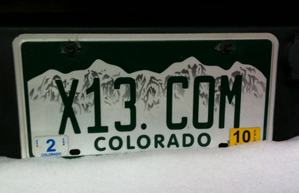 First is X13.com from Scott Galvin in Colorado. Colorado, like Texas, allows you to get a dot on your license plate. But Galvin has a funny story about that. He says he was pulled over in Boulder and given grief for altering his license plate, but then the police officer gave a quick inspection by rubbing the dot and realized it wasn’t a sticker. “If I had added it, I would’ve at least centered it!”, Galvin joked. Another entry doesn’t have the dot, because Washington state doesn’t allow them. This one comes courtesy of Matt McGee, @U2 Founder/Editor. He said he’s had these plates for over a decade. As a quick side note, I found out that publishing a photo of a license plate in Texas is illegal without permission of the plate owner. I’m not sure exactly how that rule works on the internet, but it’s best to get permission before posting a photo of a license plate.